American’s take the promise of life, liberty and the pursuit of happiness for granted. The very fact that I can type these words and distribute them is testimony to the freedoms each of us have as individuals to say what we think in a free society. Memorial Day weekend has become trivialized as the joyous start to summer and while it is a great thing to celebrate the end of the grip of rain and cold as we look forward to warm days and nights, the three–day weekend is not about barbecues and picnics, or the latest sale at the new car dealership. It is about remembering and thanking those who have given their all to protect the freedoms that we enjoy. Memorial Day is about thanking a Viet Nam veteran forty years later, who never was thanked for his service. Memorial Day is about sending a card of thanks to Walter Reid Medical Center, the Naval Medical Center in San Diego or any local veteran’s hospital in your state that thanks someone you don’t even know for their sacrifice. Memorial Day is about taking your kids to a veteran’s cemetery and laying flowers on the grave site of someone which may not have been visited for a dozen years as a thank you, and take that opportunity to share the sacrifices made for freedom with the next generation. Right now, hundreds of thousands of U.S. servicemen and women are away from their families in far flung places around the earth standing guard for our freedom to disagree openly over the direction of our great nation. Every one of them is putting their lives at risk for each of our freedom. 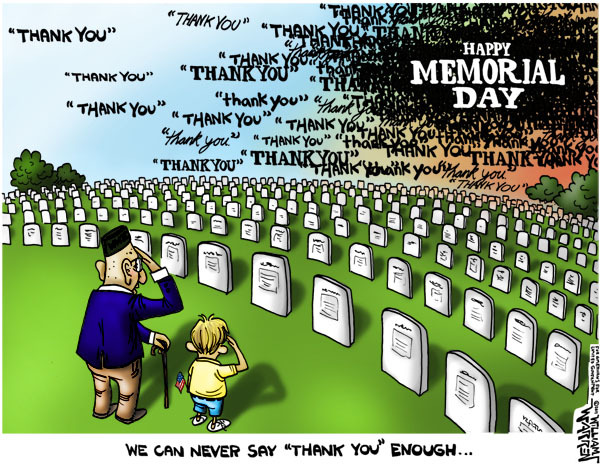 Memorial Day is the one day a year, where Americans say thank you. As you fire up the barbecue, please remember those who are in some dusty hole in a place far away dodging enemy fire. Remember those who marched through rice paddies under fire from an unseen enemy. Remember those who stormed the beaches of Omaha, Iwo Jima and Guadalcanal. Remember those who fought the forgotten war in Korea. It is these brave men, who have made it possible for us to stand today as the greatest country in the history of the world. Let us never forget them, and pray to God that we continue to protect what they gave so much to give us. On this Memorial Day, let’s remember that America is worth fighting for. Rick Manning is the Communications Director of Americans for Limited Government. This entry was posted on Tuesday, May 31st, 2011 at 10:04 pm	and is filed under Elections, Opinion, Editorial, and Analysis. You can follow any responses to this entry through the RSS 2.0 feed. You can leave a response, or trackback from your own site.